The best of Vermont awaits at this charming 2-bedroom, 2-bathroom vacation rental townhome in Stowe! Nestled amidst pastoral fields with remarkable mountain views of Mount Mansfield, this home is the perfect escape for up to 5 guests wanting to explore the area’s unabashed beauty. Ski the nearby slopes, hike through the mountains, or have a taste of the local brews before coming home to take a swim in the resort’s pool! As you enter into Stonybrook - a condo complex resting on 160 private acres - you’ll be immediately entranced by the home’s rustic charm and tranquil surroundings. Step inside to relish the 1,500 square feet of tasteful decor, hardwood floors, and vaulted ceilings. After a long day of exploring the area, settle down together on the living area’s plush couches as you admire the remarkable views out the long-view windows. Grab a board game from underneath the wet bar to play while you watch a movie on the flat-screen Smart TV. When hunger strikes, satisfy your cravings in the fully equipped kitchen, where you’ll find everything you’ll need to prepare your favorite recipes! Gather your family around the dining table to enjoy each other’s company, or grab a quick bite at the breakfast bar before getting back to your daily activities. Come nighttime, the home offers 2 well-appointed bedrooms for you to choose from. The master bedroom comes complete with a plush queen bed and its own private balcony, while those staying in the second bedroom can enjoy the comforts of 2 twin beds. In the morning, you’ll have plenty to explore just inside the Stony Brook complex. Stroll around the land, dive into one of the 2 swimming pools, challenge a companion to a game of ping pong in the game room, or play a round of tennis - all before returning back to enjoy the unobstructed mountain views from the deck! A true four-season destination, Stowe offers endless opportunities to enjoy the outdoors. Hike to the top of Sunset Rock or through the serene Wiessner Woods. During wintertime, the skiers in your group will rejoice over the snowy slopes found in Stowe Mountain Resort. Take a drive to Stowe’s charming downtown, where a plethora of quaint boutiques, farmer's markets, breweries, music festivals, galleries, and museums await! If you’d like a break from cooking, choose between both red and white pizzas at Pie-cassos, treat yourself to some comfort food at Harrison’s, or enjoy a hearty breakfast at McCarthy's. - Amenities include a fully equipped kitchen, air conditioning, central heating, free WiFi, 3 flat-screen Smart TVs, DVD player, in-unit laundry machines, balcony, furnished deck, gas grill, outdoor dining area, and more! - Community amenities include 24 hour management, 2 swimming pools, 6 tennis courts, a sauna, game room, fitness center, and more! 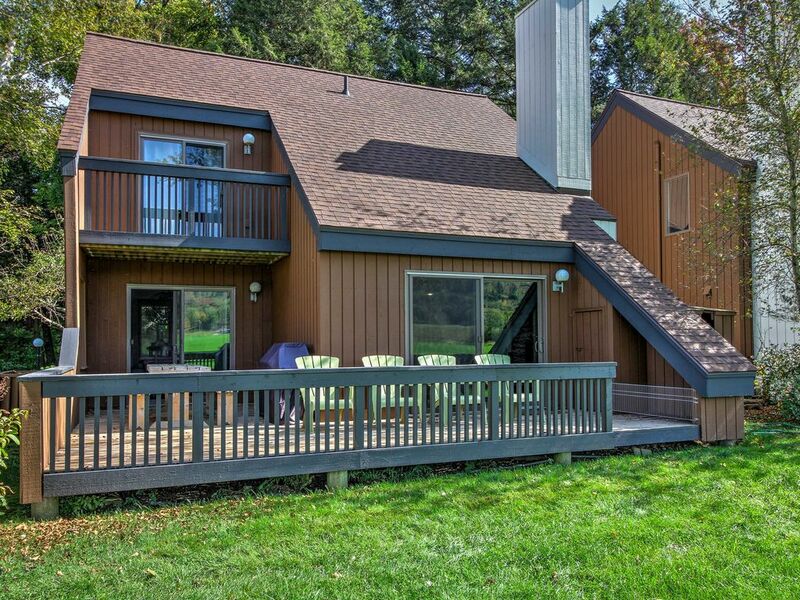 - Quiet Stowe location - Easy access to restaurants, shopping, hiking, mountain biking, skiing/snowboarding, swimming, fishing, and so much more! Beautiful property with all the amenities needed for a relaxing mountain vacation. Property Manager was fantastic, ensure all my needs were taken care of. Great proximity to Alchemist (walking distance) and downtown Stowe. Views were amazing as well! Can't wait to come back! This townhouse in Stowe was clean, well maintained with a large back deck where you could enjoy the incredible surroundings. The location of the townhouse was at the edge of the complex, very quiet. Just wish we could have stayed longer. setting. Hope to return to same unit next year, same time. Great Condo. We have been visiting Stowe for more than 20 years, particularly in the Summer time. Typically we stay at a local top-rated hotel. Over the years, however, we have also rented short-term vacation home rentals... some even within the Stoneybrook Complex. This year we were fortunate to have found this amazing townhome unit while searching for a place to stay for our annual visit to Stowe. It was / is perfect!!! Super Clean and tidy, well organized, well equipped, freshly renovated, fully stocked, well thought out, every comfort of home provided, etc.... Also we should note that the house was well A/C (nice and cool on a very hot day!). We cannot say enough good things about this townhome unit! The only issue for us was that it was unfortunately available for such a short period of time.... but... we are already looking forward to our stay next year at this home (hopefully for a slightly longer period of time). It should also be noted that the owner/property manager (Todd) and Susan who was responsible for the property maintenance, were both extremely accommodating, helpful and friendly! We highly recommend this vacation rental home! We loved everything about this townhome! This place is in a perfect location and the view is amazing! The owners left very thoughtful detailed instructions on how to find and use everything in the unit. It was super clean, comfy and well stocked. We used the bike path that has an entrance on the property to get everywhere. The kids found a couple great swim spots off the path and my husband loved being able to ride to The Alchemist Brewery. We really only used the car to check out Bingham Falls (which was beautiful). None of us were ready to leave when our stay was over and I'm already looking at my calendar to book again.